Dreaming of pink the pink topaz accents and sparkling cubic zirconia make the colors come to life in this "Only Us" ring. Placed in a 14K white gold band, this two stone ring, measuring 6mm with a total carat weight of 0.13, is an exquisite statement of elegant womens jewelry. Hand crafted especially for you by the experts of Apples of Gold. 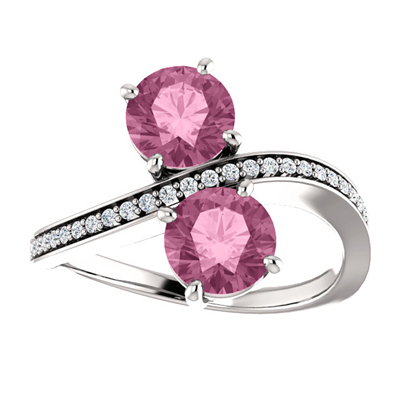 We guarantee our "Only Us" Pink Topaz and CZ Two Stone Ring in Sterling Silver to be high quality, authentic jewelry, as described above.